Knicks player Enes Kanter is speaking out against Turkey's president, even as Turkey says it's seeking an international warrant against him, claiming he's a member of a terror group. Jonathan Dienst reports. 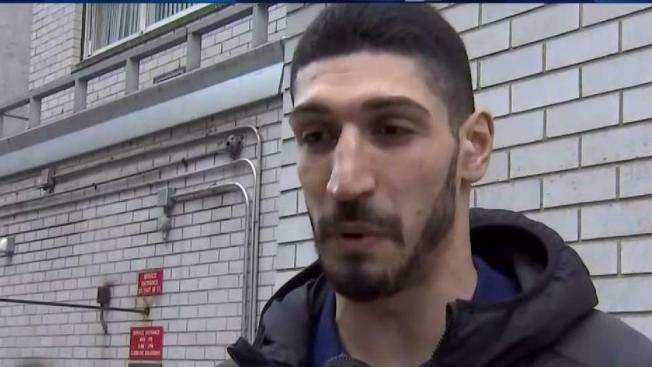 New York Knicks player Enes Kanter is defiantly speaking out against the president in his native Turkey, despite Turkish prosecutors' attempts to seek an international arrest warrant against him. "Leave the innocent people alone," he said in a message to the Turkish government during an interview with News 4 New York on Wednesday. "It doesn't matter what you do, I will continue to talk about this. This is way bigger than everything. This is way bigger than me." Turkish prosecutors are accusing Kanter of membership in a terror organization. Sabah newspaper says the Istanbul chief prosecutor's office had also prepared an extradition request for the NBA player. Officials at the prosecutor's office could not be reached by The Associated Press for comment. "I'm not a terrorist," he added in the interview with News 4. "I only terrorize the rim." Kanter admitted he was scared of traveling overseas, telling News 4, "Erdogan's long arms are everywhere. The Turkish government is very famous for hunting down people who talk against the government. So if I was in London, I would be in a very dangerous position but luckily I didn't go." "He's definitely abusing human rights," Kanter told News 4, saying tens of thousands of people were in jails, including women and babies, and that schools and dormitories were being shut down. "Lots of people are getting tortured in jails," he said. "I'm not just saying that, the reports are saying that. That's why I'm trying to be the voice of innocent people." "People know my story because I play in the NBA but there's lots of people out there who don't have a voice so that's why I'm trying to be the voice of them." Kanter doubled down on his criticism of Erdogan, saying, "He's a very bad guy. He's trying to use his power to abuse people. And he wants to be a one-man show. If you don't think the same way he thinks, you're a bad guy." "I mean, he just told me today that I'm a terrorist because I don't think the same way he thinks," he said. "So that shows there's no freedom of speech in Turkey. That's why it's sad for me, my friend, my family, because they're still back there waiting for help." Kanter dismissed the Turkish government's accusation that he tried to help the cleric Gulen overthrow the government in July 2016. He said he was with the cleric that night of the coup attempt when the cleric's assistant brought the news. "He was shocked, I was shocked, we didn't know what was going on," said Kanter. "And then later on, Erdogan came out and blamed Mr. Gulen and his movement. I was with Mr. Gulen that night, and all he did was sit on his chair and pray for his country." "It's very sad because all Mr. Gulen is trying to do right now is, you know, try and bring some peace in this world," he said. "Every time I go there, he always talks about 'Leave your differences on the table and try to find what we have in common,' and 'How can we make this world a better place to live in?' That's why what Erdogan is saying is wrong." Kanter is undeterred by critics who said he shouldn't get involved in politics. "Everybody ask me if I'm crazy -- my teammates, my friends, my family," he said. "'Why are you talking about this? Just make your money, play basketball. You play in the best city in the world. Just have fun, you're 26 years old.'" "But I think what I'm doing is way bigger than basketball, way bigger than NBA," Kanter continued. "I'm trying to be the voice for all citizens who don't have a voice. And I will continue to keep talking the truth and stand up for human rights, democracy and freedom."